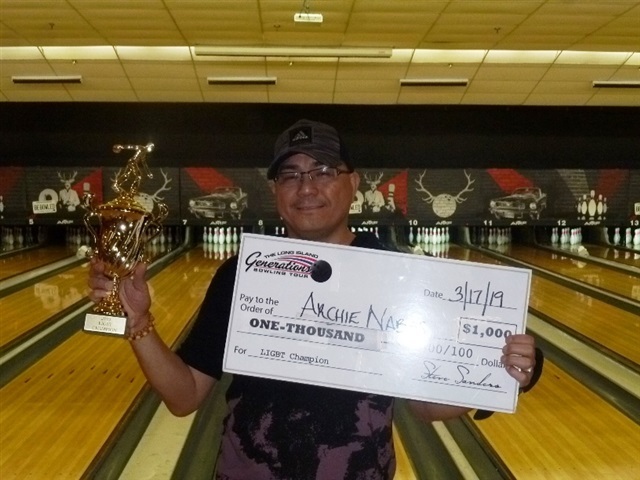 E. Meadow, NY: Archie Nabas, a 48 year old left-hander from Queens Village, NY won the $1,000 top prize at LIGBT’s sport shot event at AMF E. Meadow. Archie’s 2nd title this season, and third overall, was accomplished when he defeated Donald Eubanks, Elmsford, NY 230-228. While Donald earned $500 for second, finishing in third was So Young Chin, Whitestone, NY with a 202 worth $300. Rounding out the top 4 was Rodney Williams, Central Islip, NY with a 184 worth $250. The final shootout was close the entire 10 frames. Archie, who was giving handicap to the other 3 bowlers, shot the only clean game in the shootout. So Young couldn’t throw a double and Rodney had trouble making spares. Donald, who had opens in frames 3-5, threw a triple in his last 3 frames to force Archie to mark in the 10th. Archie left one pin on his first shot and barely converted the spare to clinch the victory. Everyone watching thought Archie “threw away the title” but he avoided embarrassment by just one inch. The AMF E. Meadow event drew a good crowd of 99 entries, advanced 14 bowlers to the finals and cashed another 12 bowlers for $75. The total prize fund paid out $4,650 with all finalists earning at least $150. The scores on the Kegel Turnpike pattern were low as it only took a 659 in both squads to cash. High series of the tournament was shot by John Tiburzi, Holbrook, NY with a 759 in the 3pm squad. The wildcard winner was 2nd place finisher Donald Eubanks with a 1324 six game series. LIGBT’s next tournament is a special sport shot event at AMF Babylon on Sunday, March 24th: noon-2pm-4pm. This is a “Beat the Board” Tournament with guaranteed top prizes of; $1,500-$750-$500-$300 and 24 bowlers making the finals. To view the final results of the AMF E. Meadow event please visit www.ligbtour.com. The LIGBT is sponsored by Kegel, Knockout Ball Cleaner, Torch Bowling, Billvee Electric, & Vietri Associates, and ManyStylesOfBowling.com.